Remember when light up shoes were only for kids? Well not any longer! Light up shoes are fun for adults and children. They offer light when walking in the dark, and are a great way to express yourself wherever you may go. 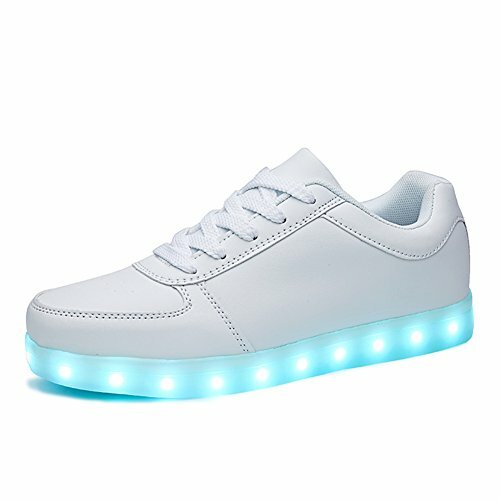 LED light up shoes recharge so you can have a fresh charge every day, and you never have to worry about your lights going out due to a dead battery. Plus the rechargeable shoes eliminate the impact that one-time use batteries have on the environment. There are many colored light choices, or you can choose color-changing modes to keep things even more interesting and fun. Men, women, boys and girls will love shoes that light up with every step. They are cool when walking or running, and you'll stand out from the crowd, too. You can get light up shoes in a variety of shoe colors, too. From black or white, to colorful options the entire family will enjoy. They all light up and are perfect accessories to any outfit. Imagine playing kick ball outdoors at night with everybody wearing light up shoes. You'll have a glowing good time, and everyone will love watching the shoes as much as they do the game. You can also do a charity walk at night and enjoy the lights from the light up shoes, or take a stroll with a loved one or friends. Light up shoes also show up well during the day, so you'll enjoy them just as much as you do at night! Kids and adults will enjoy getting a pair of light up shoes as a gift for any occasion, too. Find out their size and favorite color, and you're sure to find the perfect shoes for everyone on your gift-giving lists. 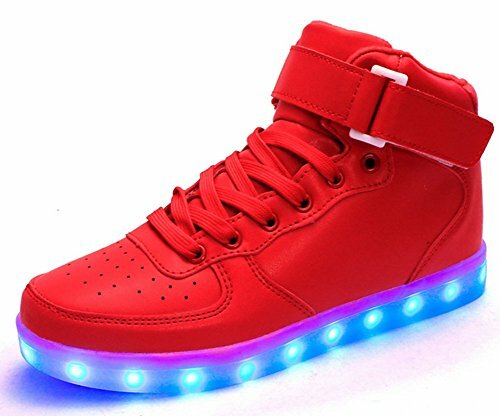 Light up the world around you with these cool light up shoes. ​USB Rechargeable: Easy to recharge the shoes with USB cable, android phone USB cable. The charging time is 1-3 hours. 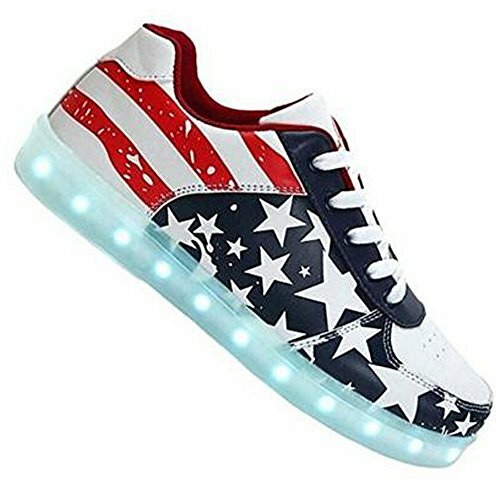 Occasion: The LED shoes are perfect for the club, party or a night out occasion, great choice for you to be noticed, also is great gift for lovers and kids for birthday, performances, Halloween, Thanksgiving and Christmas Day and other celebration. Note: Please do not use it as running shoes and other fierce sports shoes. Otherwise it will damage the light system and the shoes will not light up. 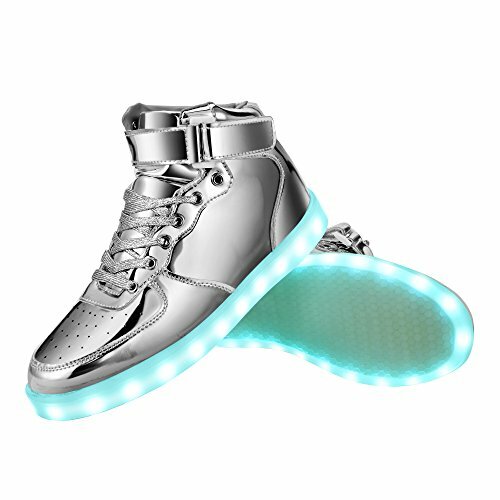 ​The Light-up LED shoes are perfect for the club, a rave party, performances,cosplay, night outs or just a night out on the town. When the sneakers are switched on, the LED lights will give colorful bright lights. PU leather Rubber sole. Lining Material: Cotton Fabric. Switch Instruction: Hidden switch button beside the charging port. Press it to switch on. With each press,it changes to another light mode. Press the switch for 12 times to turn the light off , or keep pressing for 3 seconds to turn off the power. ​Light Modes: light on from 1.red(steady) -2.blue(steady) -3.green(steady) -4.purple(steady) -5. Sky blue(steady) -4.yellow(steady) -7.white(steady) -8.white(twinkle) -9.slow auto-change mode -10.fast auto-change mode -11.twinkle + auto-change mode -12.light off. ​Suitable for vacation/hiking/school, etc. This pair of shoes not only quality clearance, and the price is very nice.I believe you will love it. Why not buy this shoes back? NOTE: Switch on the inside of the shoe, next to the charging plug, when you see the lights begin to darken or only two colors, you need to consider charging. Normally according to different cities,It takes about 7-15 business days arrive at US.